Tonight's red post collection includes Fruity Sebbles announcing upcoming champ updates for Kassadin & Ryze, Lyte with a dev blog on Player Behavior Design Values: Reward, Riot Ahab with an NA Server Roadmap update, new Tristana champion spotlight, Pwyff on Nidalee's Q/W rooting monsters, and more! [Updated] 1/29 PBE Update: Heartseeker Ward, Fiddle and Veigar texture rebalance, & more! First up we have Fruity Sebbles with an update on what the Champion Update team is working on, including upcoming visual updates for Kassadin, visual and gameplay updates for Ryze, and continued work on the Poppy update! Fruity Sebbles here on behalf of the Champion Update team. It’s been a while since we last shared what the team’s been working on, and now that we’re wrapping up Tristana’s update I’d like to preview some of our current projects and the thinking behind them. If you prefer the TL;DR, we’re currently working on a visual update for Kassadin as well as a more general Ryze update. We’re also still cranking away on Poppy’s comprehensive update. Read on if you’d like details straight from the designers! DISCLAIMER TIME! Please keep in mind the following does not represent a comprehensive list of what’s on our radar or even being worked on. Everything mentioned below is tentative, not tied to specific delivery dates, subject to change, delay, cancellation, obliteration, etc. In case you missed it, Tristana’s update is now live! As with all our projects, we’ll be monitoring Tristana closely post-release in case she needs any final tweaks. She’ll also be getting a new splash in one of the upcoming patches. Confession time: I've been a massive Kassadin fanboy since the first time I played him. The misunderstood hero who turns the dark power of the Void back on itself, fighting fire with fire, standing alone against a force that could threaten all of Runeterra - how awesome is that? We can all agree though that Kassadin's visuals could do a lot more to live up to his awesome premise. 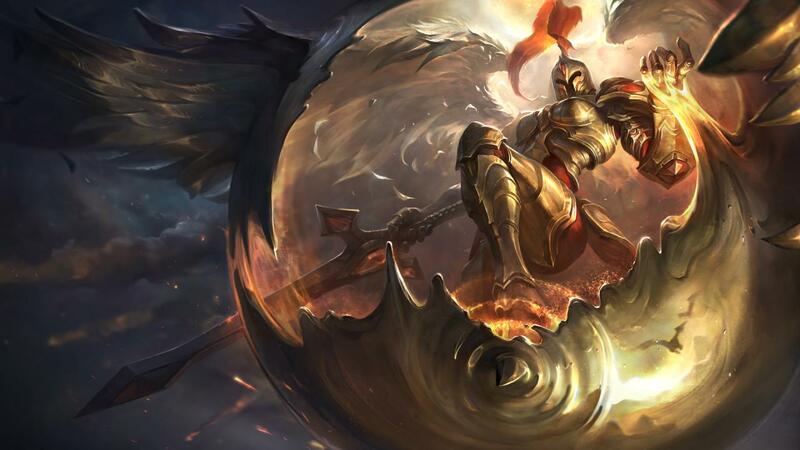 As one of the original 40 champions, he's been left behind as League’s visual quality bar has continued to rise over time. Unlike some older champions, Kassadin has always had a distinct personality and theme to his visuals, and we definitely want to maintain those traits in the course of this update. Our approach has very much been to take Kassadin’s unique identity, locate the most important elements in his visual design, and then refine things to match LoL's current standards. Kassadin's latest splash did a great job of following that approach and served as a useful reference point for our work. We’re also focused on improving Kassadin’s in-game read. His original model has such a strong contrast between the black costume and its white trim that details become difficult to discern at in-game scale. Nudging his color scheme in ways that improve his in-game read without changing his identity will allow us to really highlight Kassadin’s key visual elements and make him pop on the Rift. Ryze inhabits a unique space within League of Legends. He’s not a standard fantasy wizard with white hair and robe. He doesn’t cast magic using a wand or incantations. We want to make sure his update communicates these traits and reinforces his uniqueness. With that in mind we plan to keep his major reads (blue skin, big scroll, spell book) while streamlining and updating some of his details. With Ryze’s update we want to better convey that he’s a master of magic (and running) in a way that’s kinetic and physical, almost punching his magic out in the same way an expert martial artist expresses his skill. Communicating the runic element is also important, so glyphs, runes, and other forms of character-based effects are key factors. Since we’re solidifying Ryze’s identity as a solitary and nomadic mage who’s on the run, we want to make sure that’s reflected in his appearance by playing up a more rugged feel to his gear and clothing. Again, we want to remain faithful to his major reads while injecting a little more grit that shows off his resilience as a hardened spell-slinging battlemage. Ryze’s kit has a strong identity, but it’s pretty binary based on his distance from you. Get too close and you’re getting hit by the full force of his “always on” kit, every time. This limits our ability to tune him as he’s an absolute terror when his numbers are too strong. Thus, our overall goal is to preserve his particular identity as a "tanky, in-your-face mage" while focusing his power into windows that create more relevant decisions for both Ryze and his opponents. Essentially, we want to increase the highs and lows when Ryze is in a scrap - bigger wins when he’s skillful, as well as better opportunities for his opponents to interact with his gameplay. To do that, we have to build more unreliability into his kit. Skillshots are one way to do that, with his Q the obvious candidate to become a skillshot in return for longer range. We do like Ryze’s brand of close-range mastery, so rather than turn everything into skillshots we’re building clearer power/timing windows into the rest of his kit. Finally, we want to better visualize and clarify Ryze’s power as well as what exactly he’s doing to his opponents. Some examples include better presenting his rapid-fire casting and making his E’s behavior more controllable and understandable (again, for both Ryze and his opponents). Fear not, we’re still working on her! Check her section in last year’s Champion Update dev blog for the early details. That’s it for now. We’ll be back with more updates as these projects (and others!) move closer to completion! "Currently we're looking at a full Visual & Gameplay Update." The plans include a lot of the known big updates, the Visual & Gameplay Updates (VGU's) which are planned out usually super far as they need a lot of planning for execution. The projects can take months to do (maybe a year). They're heavily comprehensive. They're often used for the worst offenders in our game, often characters that need complete gameplay, art and thematic rebuilding, sometimes one of those aspects, sometimes all. The Sions, Tarics, etc. We slot and fantasy slot these far in advance. The opportunities include lower scope Model & Texture Updates (MTU's) which aren't planned quite as far out, and are usually jumped on when we see an open slot, or a new gameplay update has been cracked, or we have the ability to borrow art resources from another team. Also when they're themeatically "safe". Nasus was done in this way. The legendary skin enabled his VU. These MTU's are usually built on what we have, existing rig, tweaked animations, etc. The reason being is that if we made them as high scope as full large-scope projects, you wouldn't see them for a year or more. We simply can't accomodate doing 8 Sions a year. While yes, a lot of these champions could benefit from complete tear-downs, we have great opportunities that present themselves. In Kassadin's situation, Tokkelossie, being a big Kassadin fan, had made a completely new model on his own time. So boom, we had a start. Additionally, we started working with an outsourcer that has proven really, REALLY effective in making quality models, and we've begun to leverage them on skins, especially existing skins for VU's. The fast ramp-up can be attributed to having the existing new base model, some work the skins team had been doing, his VFX being in a good place, and a 3D external partner able to handle both reconcepting and remodelling the existing skins allowed us to jump on this. Would it be nice to burn everything down and rebuilt it from scratch? Sure, if we can do that in an optimal time. We could knock down the house, re-pour the foundation, build a new frame, etc. But sometimes, because the opportunity to save time and resources is there, we build on top of a workable foundation with the frame intact." "We've taken that honest look, and given time, planning, resources, etc. 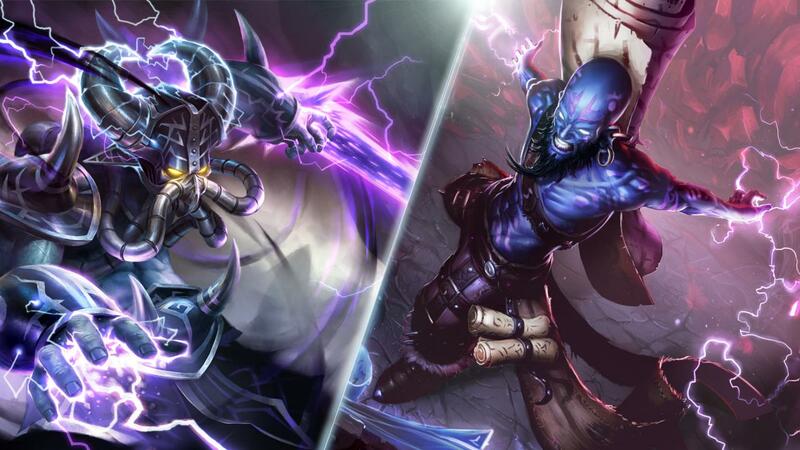 This is what we can do to deliver some badly-deserved quality for Kassadin in a timely manner." "Weeks to months rather than months to years :P"
If we were to do this with every champion we wanted, we wouldn't be putting out a new update but once every so often. So while we take our larger projects through this longer pipeline, we cant take every project champion update chooses to touch through the process. "Right now, with the current outlook, Kassadin VO wouldn't be in scope with what we're planning. It's of course a nice-to-have, but right now the bandwidth we have is mainly in the modelling department. Given the current constraints we feel what we're planning will add value in a time frame that won't leave players hanging for a year." "She's currently in pre-production, I may or may not be personally working on her.. cuz.. ya know, armor." "Cho'gath is pretty massive in scope. Currently he's someone we'd like to fantasy slot, but it'll be entirely dependent on technical resources that are allocated to the team. Right now there's not enough animation bandwidth to do what we'd really want to do. That said, we may try experimenting with him on the Battlecast rig which might allow us to speed up development, that's not an immeidate priority right now but it's one I'd personally like to see us take on sooner than later." "No idea. This is a tough one and will need probably the same amount of pre-production time as Sion, if not more." "Currently we're not planning on continuing with traditional skins, as we haven't seen as much value payoff as we initially thought they'd provide. That could change, but currently that's our stance." "Taric is pretty far along in the gameplay design process already. He's my other current project, along with Ryze." "TLDR: Our player behavior philosophies include punishment, reform and positive reinforcement. With rewards, we have to be careful to design systems that don’t simply incentivize positive behavior for a small duration, but provide reasons to stay positive all the time. Last time, I mentioned that Drevarius would go into a deeper dive on punishment in this blog, but with the surprise Mystery Gift for positive behavior going out to 95% of players in 2014, we wanted to take the opportunity to jump ahead and explore our philosophies around rewards and positive reinforcement. One of our core philosophies is that there's no silver bullet to improving player behavior in online games, and you always need a mix including punishment, reform, and positive reinforcement. In 2014, we focused on the community and self-reflection. We ran a few experiments, including an exercise where players reflected on their last 10 games and we all came to the conclusion that the one negative experience that happens occasionally should not define our community. With Snowdown’s celebration of everyone coming together to be a part of the Legend of the Poro King, it was a great opportunity to deliver a positive behavior surprise. One of the keys of positive reinforcement is the idea of “schedules,” or the expected frequency of a reinforcing event. Introducing surprise rewards unrelated to specific activities or durations is one of the most effective ways to encourage positive player behavior. The surprise element is crucial: imagine an achievement system where, if you are sportsmanlike for your next 10 games, you unlock a free skin. Players could simply behave for 10 games, unlock their gift and go back to playing the same way they were before (whether that’s positive, negative or neutral). So, instead, we’ll continue to surprise players once in awhile for their positive behavior. Because players aren't sure what the next reward is (or when it is), players will strive to be sportsmanlike in a larger range of games to try to get all the surprises. For positive players in the game, this won't really affect them and they'll just get surprises every so often for being awesome. For neutral players, this effort might convince some of them to put in that extra effort in a few more games to get the next surprise. For negatively behaved players, this effort might also encourage a few to change their ways although we expect the biggest impact to be with the neutral players. It's All in the Surprise! In future roll-outs it’ll be possible for players to earn the next surprise so long as they've been positive since the last surprise was awarded. So, if you were chat restricted and missed a surprise, you could still be eligible if you were positive in the time range between that one and the next. Also, keep in mind that not every surprise will be a mystery gift. Every surprise will differ in magnitude, and be tailored to different players. For example, the last surprise before the end of Snowdown gift was an IP Boost, mainly beneficial for newer players still building out their champion pools. Other surprises may include collectibles like unique summoner icons (which some players will remember we’ve tried before with the Santa Baron icon). In the last blog in this series, we’ll be back to discuss punishment as a deterrent for negative behavior and our philosophy around it. Thanks as always, and we’ll see you in game! "TL;DR: We’re actively partnering with ISPs across North America to build a dedicated highway for League traffic. So far we’ve built what we call the “north bridge”, which services connections in the northern US and Canada. Work is ongoing, and the goal is to create a unique network dedicated to transporting League traffic across the shortest, most stable route possible. Riot Ahab here again with a mini-update on what’s happening with the new dedicated League network we’re building in NA. In case you missed the original announcement and Q&A we posted earlier in January, you can check it out here. These updates will serve as a peek behind the curtain as we continue to build out this network across NA. We can’t share all the nitty-gritty details due to contractual complexities and security concerns, but we can provide a picture of what we’re doing as we go! For this first update, let’s explore an overview of what we’ve already built up to this point: the first half of the network, which we’re calling the “north bridge.” Currently, this bridge is pathing League traffic for the northern US and Canada and is built out of a series of strategically-placed PoPs (points of presence) with direct connections between them. What’s the “north bridge”, and what the hell is a PoP? Think of it this way: if this direct network is a dedicated highway for League traffic between you and the servers, think of the PoPs as “on-ramps”; they get your data on the highway to the servers in the most direct route as physically possible. The first part (physical hardware) is pretty straightforward: buy some server space and make sure the on-ramp allows League traffic to hurry along onto the highway. The bigger challenge, as is true with real highways, is making sure local traffic finds its way to the on-ramp--otherwise the highway does little good! This is where peering agreements come in: these partnership agreements mean ISPs now redirect League traffic off of their networks and toward the nearest PoP. Once we’ve made a peering agreement with a local ISP (which for big ISPs, like any contractual arrangement with a big company typically takes a fair amount of lawyering back and forth), there’s often a decent amount of necessary fine-tuning with that ISP. This is important because different ISP algorithms can send traffic bouncing around before it loops into one of our PoPs, much like poorly laid-out street signs could send you driving several towns over and back again before finally finding a PoP on-ramp. Which means on our end we have to track down inefficient pathing routes and work with the ISP to redirect that traffic to make sure it’s taking the most direct route to the closest PoP. It takes a little work, so bringing a PoP online and securing peering agreements doesn’t always mean that everything is working as it should from the get-go. Plus, ISPs change-- things break, they merge with other ISPs, split up, new ones may come, and old ones may go, which makes peering and fine-tuning a constant, ongoing process. 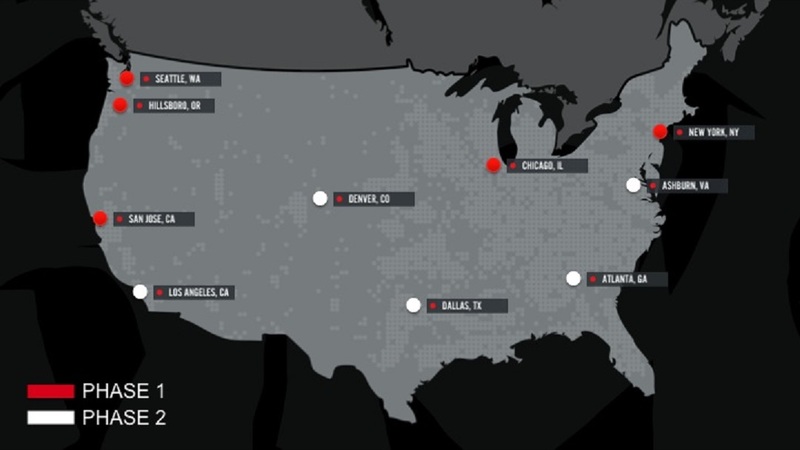 Red dots represent live PoPs we’ve set up so far. In those areas, we’ve installed hardware and are actively working through agreements with local ISPs. Grey dots indicate PoPs that are still in-progress. We’ll post additional updates as those grey dots come online. This map doesn't show the direct paths connecting the PoPs, but if you connect the red dots you can see that the north bridge is largely complete. We still have plenty of peering contracts to negotiate with ISPs in these markets so we can make sure local traffic is taking the best possible path to its local PoP, but we’re off to a good start. Typically, we first target the biggest ISPs in any given market because many major ISPs often provide traffic peering routes to smaller local ones (and you’ll find a list of ISPs that we’re currently partnering with at the bottom of this post). So if you’re on a smaller ISP, your connection could likely peer through the larger ISP companies we have agreements with and already be on this new network! Connections running through this network should experience a more stable, consistent experience while playing League, since it’s taking the most direct route possible to the game servers. When Phase 3 of the NA Server Roadmap deploys, this network will provide as many players as possible a comparable ping when connecting to the more centralized server location. But we'll speak more on that in the future! Live nearby a red dot on the map above? Experienced any drastic fluctuations to your connection in the past few months? Let us know in the comments below. Knowing your local postal code as well as ISP helps us figure out how your data is being routed, but keep in mind if your ISP isn’t yet on the list of current partners below, there’s a chance your data might not be pathing through our network yet. We’ll post our next NA Server Roadmap update with what we’re actively doing to deliver a consistent quality League connection as well as let you guys know once we’ve started bringing the southern bridge online. Until then, thanks for reading! We’ll stick around for the next 4 hours to answer whatever questions we can. Altopia Corporation, Atlas Networks Corporation, Charter Communications, Clear Wireless, Cogent Communications, Comcast Cable Communications, Eltopia, Hurricane Electric, Interconnected Associates, LS Networks, NetRiver, NTT America, Pocketinet Communications, Rogers Cable Communications, Saskatchewan Telecommunications (SaskTel), Shaw Communications, Syringa Networks, TekSavvy Solutions, TELUS Communications, TeraGo Networks, Threshold Communications, Vision Net, WiscNet, Worldlink"
"To clarify - the list above is only the ISPs we currently have finalized peering agreements with. There's a huge laundry list of other ISPs we're in talks with, but can't talk about until we have gotten past the contract back-and-forth." "Nothing we can disclose at the moment, but we are purposefully targeting major ISP partners since getting agreements in place with the big players can also affect the data pathing of smaller ISPs in the same area." New York is the latest one to go up, so we're still working through a handful of agreements with local ISPs in that area. But I do want to clarify that once New York is better optimized, that the impact to your ping will likely not feel too substantial. Ideally your connection will result in a more stable connection with less packet loss, but your ping will likely most be impacted when Phase 3 of the NA Server Roadmap (centralized server location) is implemented. "East/West coast servers are one of many potential solutions to the connection quality issue hitting the east coast. Our position (currently, as even the best plans can and do change) -- is that we want to provide a great experience to as many players in NA as possible without fracturing the community. Between this direct network, new server architecture along with a centralized server move, we're feeling confident that we can deliver a great experience while keeping everybody together in a single NA home." "For folks outside of NA, this network will likely not help much. Once your traffic crosses the Atlantic and enters the NA network, it'll travel on the shortest, most stable route, but this map won't optimize the path between the border of NA and your machine in Europe. BUT, we are also building a similar network in EU. You can find more info here. That should positively impact your connection quality should you play in EU, but if you continue to play in NA (if, say, all your friends are on that region) - then the EU network will likely not help much since your data destination isn't the EU game servers." "Yep! The similar EU project is underway, here is a link for more info from that team!" Following her champion update in 5.2, Riot has released an updated champion spolight for Tristana! "Welcome to the League of Legends Champion Spotlight, featuring Tristana, the Yordle Gunner." Check out our coverage of the Tristana champion update for a better look at her updated vfx, voiceover, skins, and more! "Nidalee Q/W in the jungle: Hunted monsters get rooted for 2 seconds - was a change we made for less frustration, just forgot to document >_<"
Last up, the results are in and Nautilus is the winner of the OCE's Ocean Week vote! In the future, Riot will be dropping an artificial reef themed around Nautilus into the ocean! "Thanks to the amazing contribution from everyone that participated in the Ocean Week challenge we’ll be making an artificial reef! The Titan of the Depths was a clear winner in the vote, with Fizz coming in second and Nami in third. This means that the artificial reef will be Nautilus-themed. As you know this won't be a project that happens overnight, but we will keep you updated as it moves along. Remember that Ocean Week doesn't stop here, there are plenty of other things you can dive into! "